Bulgaria's Orthodox Church celebrates Tuesday, May 11, the feast day of Sts. 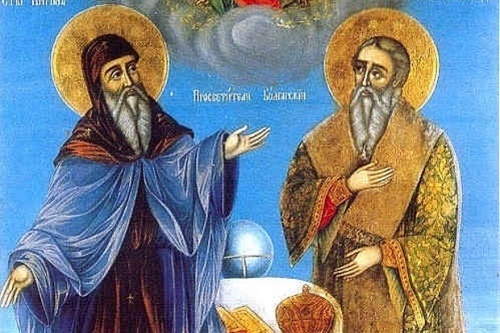 Cyril and Methodius, two of the fathers of the Slavic literary culture. The two brothers, Saints Cyril and Methodius were born in Thessaloniki in the 9th century, in 827 and 826 respectively. They became missionaries of Christianity among the Slavs and influenced the cultural development of all Slavic people. Cyril and Methodius are known as the creators of the Glagolitic alphabet, the first alphabet used to transcribe the Old Church Slavonic language. The Cyrillic alphabet, which was based on the Glagolitic alphabet, is used in a number of languages, including Bulgarian. After their death, their pupils continued their missionary work among other Slavic peoples. Their disciples introduced the alphabet in Bulgaria, putting the beginning of its journey to the world. Several centuries later, Patriarch Evtimii launched a literary reform and updated the alphabet, assuming that words are the expression of the divine essence of things. Both brothers are venerated in the Eastern Orthodox Church as saints with the title of "Equals to the Apostles." In 1880, Pope Leo XIII introduced their feast into the calendar of the Roman Catholic Church. In 1980, Pope John Paul II declared them Co-patrons of Europe, together with Saint Benedict of Norcia. The two brothers had some early missions, but in 862, they were to enter upon the work which gives them their historical importance. That year the Prince Rastislav of Great Moravia, who sought to assert his independence from the Franks, expelled missionaries of the Roman Church and instead turned to Constantinople for ecclesiastical assistance and political support. Rastislav requested that the Emperor Michael III and the Patriarch Photius send missionaries to evangelize his Slavic subjects. The task was entrusted to Cyril and Methodius, who began translating the Bible into the language now known as Old Church Slavonic and travelled to Great Moravia to promote it. For the purpose of this mission, they then devised the Glagolitic alphabet and wrote the first Slavic Civil Code, which was used in Great Moravia. In 867, Pope Nicholas I invited the brothers to Rome. Their evangelizing mission in Moravia had by this time become the focus of a dispute with Theotmar, the Archbishop of Salzburg and bishop of Passau, who claimed ecclesiastical control of the same territory and wished to see it use the Latin liturgy exclusively. They arrived in Rome in 868 where they were warmly received, partly because they brought with them the relics of Saint Clement and despite the rivalry with Constantinople. The brothers were praised for their knowledge and respected for their influence in Constantinople. Their project in Moravia found support from Pope Adrian II, who formally authorized the use of the new Slavic liturgy. The ordination of the brothers' Slav disciples was performed by Formosus and Gauderic, two prominent bishops, and the newly made priests officiated in their own tongue at the altars of some of the principal churches. Feeling his end approaching, Cyril put on the monastic habit and died fifty days later, on February 14, 869.